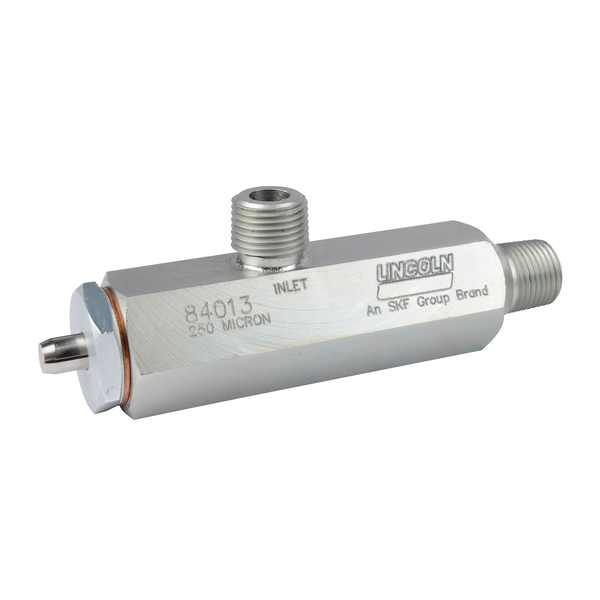 Part of SKF’s family of grease filtration products, the Lincoln small grease reservoir filling filter was developed to minimize contaminants entering automatic lubrication systems during the filling process of smaller-sized reservoirs. Installed as an inline component in the reservoir’s fill line, the filling filter helps to ensure that clean grease enters the reservoir and the system. As grease enters through the inlet, it goes through the filter and exits into a hose that is connected to the grease reservoir’s fill port. As the filter element becomes clogged, the unit’s clogged indicator pin starts to retract, signaling that filter cleaning is required. If the clogged filter element is not cleaned, grease will vent safely to a catch container. Featuring a fill rate of up to 8 liters/min (2 gal/min)*, the Lincoln small grease reservoir filling filter has an operating pressure of 344 bar (5,000 psi). It is available with either a 250- or 500-micron, removable, crush-proof filter element with no bypass. Remote mounting is possible. or visit our web site at lincolnindustrial.com.